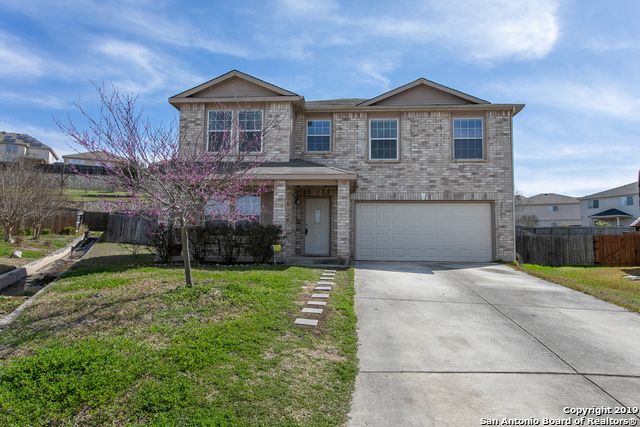 All RIVER MIST U-1 homes currently listed for sale in San Antonio as of 04/26/2019 are shown below. You can change the search criteria at any time by pressing the 'Change Search' button below. "Beautiful home tucked away on cul-de-sac. Home sits on oversized lot with greenbelt behind, no direct neighbor on right, large storage shed and lawn that is beautifully maintained. Home offers many updates and spacious living features, brick fplc, loft, and large bedrooms. Enticing kitchen offers custom lighting, spacious counter tops, and walk-in pantry/utility. Cheerful Brkfst area, separate dining for holiday gatherings, large master retreat with separate tub and shower, with large walk in cl"
"Lovely 2 story home offers 3 bedrooms, 2.5 bathrooms & game room. Gorgeous & inviting tree in front yard. Beautiful open concept floor plan w/ large picture windows throughout for natural light. Spacious living area opens up to dining area & kitchen. Kitchen w/ ample cabinet/counter space & cute window looking out into backyard. Large game room great for entertaining. Huge master bedroom w/ amazing vaulted ceiling. Cozy secondary bedrooms w/ ceiling fans. Colossal backyard w/ privacy fence! Don'"
"Beautifully fully renovated one story home! This home shows as new. Open layout. Tile flooring in dinning and living room that looks like wood. Carpet replaced in all bedrooms. Inside painted 2019, outside 2017. HVAC replaced 2 years ago. Roof replaced 1 1/2 years ago.Open spacious kitchen with stainless steel appliances, crown molding, replaced lighting, refinished cabinets and walk in pantry renovated with shelving, cabinets and barn door! Both bathrooms have been fully renovated. This is a mu"